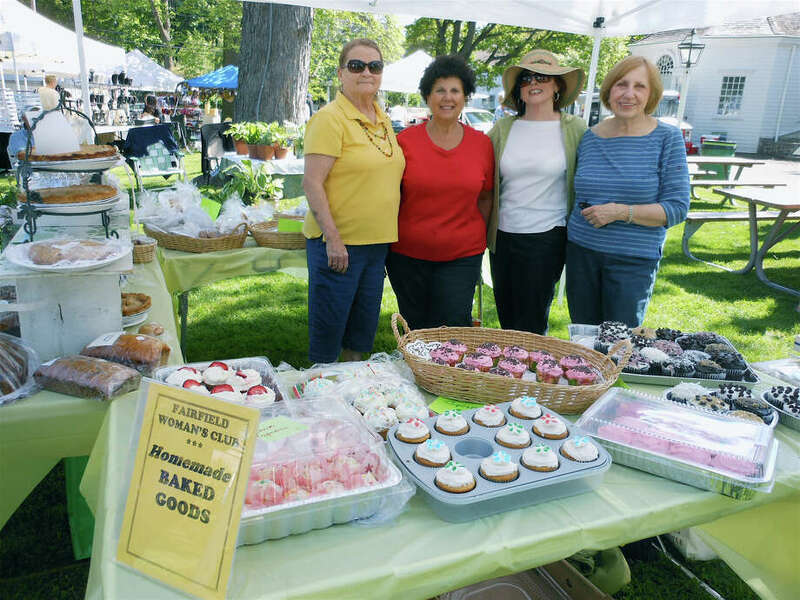 Organizers of the Fairfield Women's Club Arts & Crafts Market on Town Hall Green Saturday are, from left, Barbara Gomperts, Corinne Dellaera, Betty Walsh and Edie Szabo. Mother Nature got the message and painted Saturday's skies brilliantly sunny and blue, showcasing the Fairfield Woman's Club Arts & Crafts Market on Town Hall Green. The 30th annual event, at the corner of Beach Road and Old Post Road, attracted about 50 vendors and a steady stream of local residents come to enjoy the day and find last-minute gift items to honor Mom on her special day. "We always hold this the Saturday before Mother's Day," said Betty Walsh, the event chairwoman. "Our vendors are offering everything from jewelry and art to crafts and clothing. With the rain earlier in the week, we were thankful for such a gorgeous day today. Besides the vendors, we have grilled food from Bob's Buns on the Run, old-fashioned kettle popcorn, homemade baked goods from our club and an auction for a variety of baskets of goodies donated by club members." Walsh said the event's proceeds go toward a $2,500 high school scholarship, a drama award, FIDELCO seeing-eye dogs, an arthritis organization and military veterans, among other causes the Fairfield Women's Club supports. Vendors were housed in white tents arranged in rows on the green, among flowering plants and trees in their spring splendor. The aroma of kettle corn and hot dogs hung in the air. Visitors strolled across the grass, going from booth to booth browsing among the crafts. One craft vendor, Jin Lee of JL Craft & Design, who was exhibiting handmade sterling silver artisan jewelry, said she is a veteran of the Fairfield event. "I've been here for the past seven years," she remarked. "It's a wonderful show. I've got a lot of repeat customers who enjoy my work. I'm glad to be here." Examining a quilted checkbook cover, visitor Paula Posser of Fairfield said, "It's a beautiful day to see the crafts. I come every year and always find new, interesting things." Fellow Fairfielder Samantha Mooney, browsing with her daughters Bailey and Kelley, agreed with Posser. "We finally have some good weather," she said. "We wanted to get out of the house, were driving by and decided to stop in." Howard and Ziva Bader trekked down from Danbury to visit the show, though they were also seeing family in the area. "This is our first time here," said Howard. "It's beautiful, great stuff, wonderful crafts, very creative." Of course, those still looking for a Mother's Day gift, like Kayla Delventhal, shopping with her friends Casey Clifford and Katie Craig, found plenty of options. "Craft fairs are the best," said Delventhal. "There's such a variety of different things you can find that aren't in the mall. A lot of handmade items showing a lot of effort. Perfect for Mother's Day."